Near the thermal lake. Book with us: best price guarantee, offer within 1 hour, fast online booking. Get to know why you should choose our hotel. With its distinguished look Hotel Palace**** Hévíz emerges from the picturesque surroundings of the Hévíz Thermal Lake which is renowned for its magnificent, curative water. 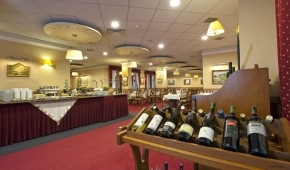 Watch the introduction video of Hotel Palace **** Hévíz. Our buffet breakfast offers international cuisine completed by domestic tastes. If you want to have breakfast in your room, our room service is also available for you! Our hotel waits the visitors with complex treatment programs which are preceded by medical examination.